From time to time we like to print comments from our customers, and this is one the nicest—if not the nicest—we have ever received. This letter comes from Dr. Susan Swartwout, the publisher at the Southeast Missouri State University Press. So please bear with us as we do a little shameless self-promotion! 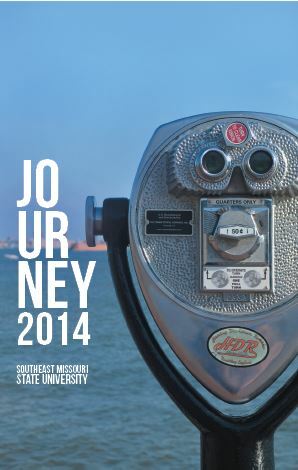 Journey is an annual literary journal that publishes original writing by students of Southeast Missouri State University. I first learned about Publishers Graphics from an Illinois journal editor in 1994 when I was an assistant editor, looking for a good printer for a poetry journal. When I became the publisher of the Southeast Missouri University Press—publishing books and several journals—I continued to rely on Publishers Graphics for high quality printing at very reasonable prices. According to state regulations, I have to acquire three bidson many of our publications. Publishers Graphics consistently offers the lowest bid and is awarded the job. Their online quote system is fantastic. Instead of waiting a week for a print quote, I have the emailed quote in my mailbox within two minutes of submitting the specs in the online form. The quotes are stored for 30 days, and the quotes that I accept are kept online so that I can easily click on the title and get a quote for reprints by changing only the quantity. The reprints are ready in a short turnaround time. This is extraordinarily convenient for keeping a small but sufficient inventory. And did I mention friendly and supportive? I never have to wait long for an email response to a question, and I can count on Publisher Graphics associates to be courteous and always willing to help. Beautiful books that get loads of compliments, great pricing, fast quotes, good turnaround, friendly, and great support: I highly recommend Publishers Graphics. They’ve been a major contributor to the success of our University Press. Southeast Missouri State University Press, founded in 2001, serves both as a first-rate publisher in an under published region and as a working laboratory for students interested in learning the art and skills of literary publishing. The Press supports a Minor degree program in Small-press Publishing for undergraduate students in any major who wish to acquire the basic skills for independent-press publishing and editing. Recognition won by our books include the John H. Reid Short Fiction Award, the Creative Spirits Platinum Award for General Fiction, the James Jones First Novel Award, the Langum Award for Historical Fiction, the Missouri Governor’s Book Award, the United We Read selection, and the Kniffen Book Award for best U.S./Canada cultural geography. [July 8, 2014, Carol Stream, IL] Publishers’ Graphics, a leading Chicago-based POD print provider, announced today that it has acquired Commercial Letter, a direct marketing printing company located in St. Louis, Missouri. The acquisition fortifies PG’s distribution, mailing, and fulfillment solutions and strengthens its ability to service the publishing industry with direct mail programs. “Commercial Letter brings a new dimension to our business, allowing us to offer not only a direct mail solution to our publishers, but also advanced supply chain programs. Integrating Commercial Letter’s fulfillment and mailing services into our technology platform will enable our customers to benefit from a highly customized distribution program, all of which aligns very well with our future strategic plans,” said Nick Lewis, President of Publishers’ Graphics. The Commercial Letter operation will eventually be folded into the PG facility in Earth City and managed by Brad Chrysler, who will stay on as Vice President of Operations at the facility. Publishers’ Graphics’ corporate headquarters will remain in Carol Stream, Illinois, approximately 35 miles west of Chicago. With a legacy spanning over a hundred years, Commercial Letter has been a pioneer in the direct mail industry, printing and sending annually over 60 million pieces of mail for clients in the healthcare, retail, academic and automotive industries. Other services include a marketing automation platform which allows users to integrate their media campaigns through mobile, email, direct mail and web channels. As a leader in POD and short-run printing for publishers, Publishers’ Graphics brings innovative procedures and workflows to book creation. Providing customized solutions to its customers has made PG a go-to resource for publishers around the world. Headquartered in Carol Stream, IL, PG has an in-plant satellite operation in Florence, Kentucky, as well as the recently acquired web offset/digital print facility in St. Louis, Missouri, formerly Corley Printing. Publishers’ Graphics distributes globally by printing its products locally on three continents through strategic partnerships. With a diverse range of publishing customers, Publishers’ Graphics offers POD, short run, and offset solutions to small, medium and large publishers alike. Through the custom development of MIS and workflows, Publishers’ Graphics will customize processes for its customers to minimize costs, and create an ease of doing business. For more information, please visit www.pubgraphics.com or www.commercial-letter.com. St. Louis Sports a New Look! New signage in St. Louis.